UNSW joined the project in 2012 with a small group of enthusiastic students and academics in the Australian Centre for Space Engineering Research (ACSER). Over the past 5 years the team has seen over 100 members work on the project, including students, staff and volunteers. The project has produced at least 18 student theses, dozens of conference papers, launched new research areas for UNSW winning two new ARC grants, and the UNSW team alone has attracted many hours of media interest both locally and internationally. QB50 is a network 50 CubeSats that will be launched together in December 2016 into a 'string-of-pearls' configuration in a circular orbit at 320 km altitude, inclination 79 degrees. These CubeSats will comprise a mix of atmospheric double CubeSats and double or triple CubeSats for science and technology demonstration. All atmospheric double CubeSats will carry a set of standardised sensors for multi-point, in-situ, long-duration measurements of key parameters and constituents in the largely unexplored lower thermosphere and ionosphere. These multi-point measurements will allow the separation of spatial and temporal variations. Due to atmospheric drag, the CubeSat orbits will decay and progressively lower and lower layers of the thermosphere/ionosphere will be explored without the need for on-board propulsion. The mission lifetime of individual CubeSats is estimated to be about three months. QB50 will also study the re-entry process by measuring a number of key parameters during re-entry, e.g. CubeSat on-board temperature and deceleration. The re-entry process will also be studied by comparing predicted (using a variety of atmospheric models, trajectory simulation software tools and CubeSat drag coefficients) and actual CubeSat trajectories and orbital lifetimes, and by comparing predicted and actual times and latitudes/longitudes of atmospheric re-entry. UNSW's EC0 (QB50-AU02) CubeSat will have four experimental objectives, excluding those specified by the QB50 requirements. These experiments have primary and in some cases secondary experimental objectives. UNSW Kea Space GPS - The primary objective of this experiment is to test the new Kea GPS board in the space environment, showing its ability to provide position and velocity in orbit. After demonstration of the boards operation, the Namuru board will be used to carry out atmospheric sounding using radio occultation. NICTA seL4 Computer - The primary objective of this experiment will be to demonstrate the use of the seL4 operating system in critical system operation in the space environment (ADCS system operation). The secondary objective is to monitor the fault tolerance of the system in a radiation environment. UNSW Rapid prototyped satellite structure - The primary objective of this experiment is to demonstrate the use of a rapid prototyped 3D printed structure in the space environment. RUSH: Rapid recovery from SEUs in reconfigurable hardware - The primary objective of this experiment is to demonstrate and validate new approaches to rapidly recovering from Single Event Upsets (SEUs) in reconfigurable hardware. Secondary objectives are to map SEU event occurrences in the thermosphere and to demonstrate in-orbit reconfiguration. 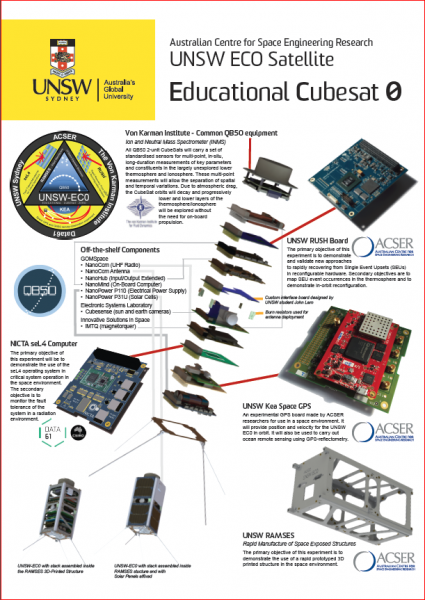 During 2015 the UNSW QB50 project completed the Assembly, Integration and Testing Review. The cubesat design progressed, with key developments in: algorithm developed for detumbling, pointing and tracking; operational code written and deployed to the flight controller board; and integration of the major subsystems into a flight configuration. The payload teams have completed development of the engineering and flight boards ready for integration. Several versions of the flight structure, RAMSES, have been produced, with the manufacturing process flinalised. The first stack integration and full functional testing was completed, and the client payload, INMS (inertial neutral mass spectrometer), was tested in both software and hardware. In 2015 the CubeSat design reached a final level of definition, and assembly and functional test was progressed. The team is now well established in their roles, and there is a good coverage of required skills. All up there are 28 UNSW and NICTA personnel working on the project. There has been $252,000 of cash committed to the project, and this has leveraged a further $464,000 of in-kind contribution through labour and technology development.